Today was my first real day in country. Yesterday didn’t count because I got to the hotel in Monrovia at 7 am, slept 2 hours, then spent the morning in orientation at International Medical Corps’ main office before traveling to the Kakata Ebola Treatment Unit (ETU) in Margibi County. By the time I got here, it was afternoon and work for the day was over. 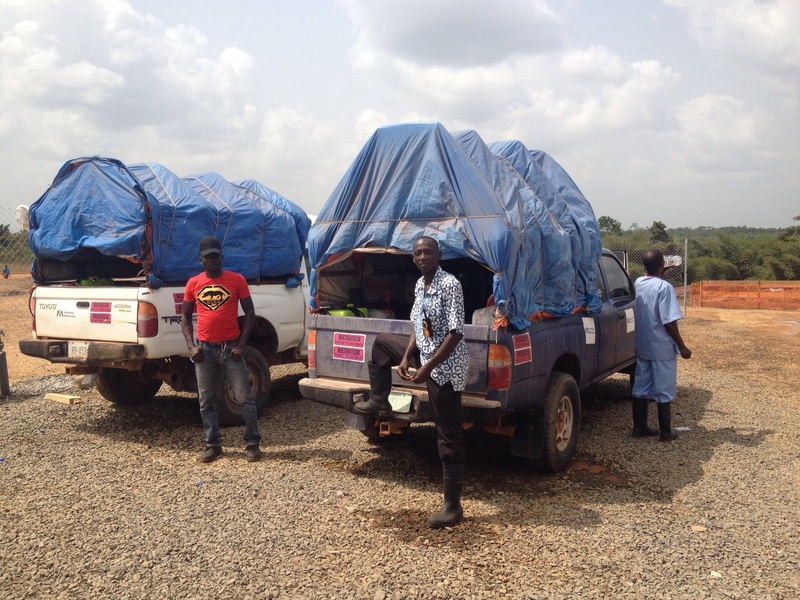 Ambulances generally don’t retrieve suspected Ebola patients past 4 pm, because if the teams get held up at all – due to poor information about the patient’s location, bad roads, vehicle breakdown etc. – they risk breaking curfew. So I got settled in, met Kakata’s ambulance team, and crashed early. This morning I shadowed our ambulance team on a call. Ideally, we bring a nurse, two sprayers, a psychosocial specialist, and a driver. Ideally. On this call, we had no psychosocial officer and only one sprayer. The ambulance coordinator I was shadowing acted as sprayer #2. To get everyone to and from the scene, we use two vehicles, an ambulance and a support truck. By ambulance I mean a pick-up truck with a tarp canopy over the bed. The front of the pick up is never exposed to the patient or any contaminated items, and the driver doesn’t leave the vehicle. Ideally. We picked our patient up from the local hospital, where he had presented complaining of weakness, nausea, headache, and fever. Our nurse first donned light personal protective equipment (PPE) – a mask, tear-away gown, goggles and gloves – and triaged the patient from six feet away. Triage means to sort. Here, it means asking the patient questions to see if s/he could have ebola. The patient has to meet a certain criteria to be taken to the “suspected” ward of the ETU. If the patient reports any contact with a sick/dead person, a fever and/or 3 of these symptoms – nausea, vomiting, headache, trouble breathing, cough, muscle or joint pain, hiccups, acute weakness, loss of appetite – s/he gets a ride, a bed and a blood draw. As you can imagine, most sick people meet this criteria regardless of whether they’re sick with ebola. When I get the flu, I get weak, achy and nauseous. Other diseases endemic to West Africa (like malaria or lassa fever) can look identical to ebola. So even as the rate of new confirmed ebola patients in Liberia is slowing, plenty of work remains, especially if we want to avoid rebound. The patient met the case criteria for a suspect, so the nurse returned to the truck to don full PPE, the suits that are all over the news. The sprayer joined in dressing up, and together they inspected each other to make sure they had no exposed skin. The patient was too weak to walk, so they used the stretcher to load him onto a cot in the back of our ambulance (bed of our truck). The nurse instructed him to drink water mixed with oral rehydration salts, and the sprayer grabbed the pump of 0.5% chlorine, which looks like a backpack connected to a wand by a hose. He then retraced their path, spraying the ambulance, everywhere they had walked and many places they hadn’t. He sprayed the whole room where patient had been waiting, then back out the way the patient had first arrived at the hospital. So much spraying. With the patient loaded, it was now time to doff the PPE. The nurse went first. She stood in front of the sprayer, with her hands out. Wash hands with spray. Raise hands up like you’re being stopped by the police. Whole front and face sprayed. Turn around. Whole back sprayed. Turn around. Remove outer pair of gloves. Wash hands. Untie rubber apron, roll down touching inside only. Place apron in bucket for re-usable equipment, bucket sprayed. Wash hands. Close eyes, lean forward, gently remove goggles, place in bucket for re-usable equipment, bucket sprayed. Wash hands. Untie hood, close eyes, gently pull hood over head, place in bucket for disposable equipment. Wash hands. Lift face, close eyes, taped zipper sprayed. Gently untape zipper. Wash hands. Lift face, close eyes, exposed zipper sprayed. Crawl fingers up zipper to find the top, slowly unzip. Wash hands. Now the hard part. Shimmy shoulders out of suit, roll suit down to ankles. There are two ways to do this: 1) Grab one side of opened zipper to lift the front of suit off shoulders, then shimmy. 2) Reach behind to grab back of suit and pull back, down and away, then shimmy. I like number 2, as it keeps my hands away from the inside of the suit. Either way, shimmy. Once suit is at the ankles, step on suit with one foot. Kick other foot back and out of suit. Repeat with other foot. Step away from crumpled suit. Suit sprayed. Gently place suit in bucket for disposables. Wash hands. Almost there! Close eyes, lean forward, gently lift mask away from face. Place in disposables. Wash hands. Stand with heels together, toes apart, like a ballerina. Boots sprayed. Turn feet to the left. Boots sprayed. Turn feet to the right. Boots sprayed. Turn around. Back of boots sprayed. Lift one foot. Sole sprayed. Step backwards out of hot zone. Lift other foot. Sole sprayed. Carefully remove inside pair of gloves. Wash hands. You’re done! High five your partner! Wait, just kidding, no touching. When the nurse finished, it was the sprayers turn. He lifted his 0.5% chlorine backpack pump into the bed of the truck, and secured it by the patients feet. That pump is the designated dirty one, it never goes in the truck’s cab and requires full PPE to use. While the sprayer finished packing up, our ambulance coordinator (sprayer #2) donned light PPE and grabbed the clean chlorine backpack pump from the cab. He stood in our designated safe zone, and the sprayer stepped in front of him to start the doffing process. Wash hands, etc. etc. etc. Finally, he stepped out of the hot zone. Wash hands. Then our coordinator (sprayer #2) removed his light PPE, returned the clean pump to the front of the truck, washed his hands, and away we went. But not before I washed my hands. I had stayed a safe distance from the whole operation, but I wanted to feel included.